Hot butter devilled shrimps (£6.50) was also delicious. 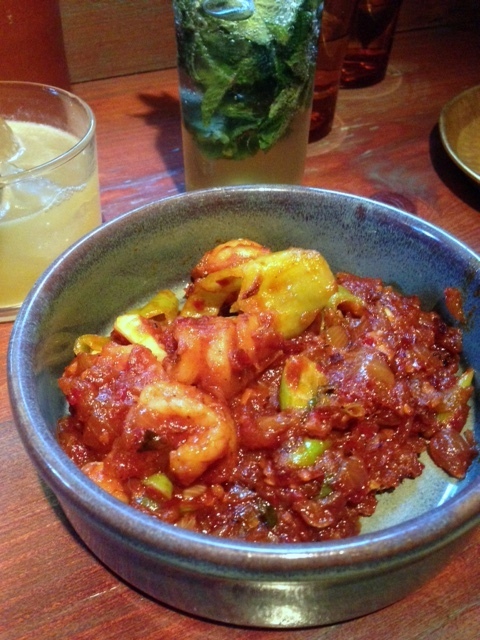 The tomato based sauce flavoured with banana chilli, ginger and garlic was packed full of flavour, offering the right balance of heat, sweetness and tanginess. This was yet another wonderful dish. And the sauce was so good that we had to order some pilau to eat with all the sauce. The hoppers are obviously the specialty at Hoppers and here you can have one with or without egg. We went for the egg hopper with (£3.50), ordering along with it all the traditional accompaniments of pol sambol, seeni sambol and coriander chutney (£1.50). This acted as the base for our black pork belly kari/curry (£6). The way to eat a hopper is to break off a piece of the hopper, top it with some of the kari as well as the various condiments. This keeps the hopper crispy, versus pouring everything into the hopper and mixing it up would then make the hopper go soggy. The kari was lovely, made with deliciously fatty pork belly and cooked with a combination of wonderful spices including coconut, toasted rice, chilli and a traditional Sri Lankan spice called goroka. The hopper was thin and crispy and really pleasant, and the egg that sat in the hopper had been perfectly cooked and was ever so slightly runny. The condiments were also excellent, as they were bursting with flavour and freshness as well as offering hints of heat and sweetness. 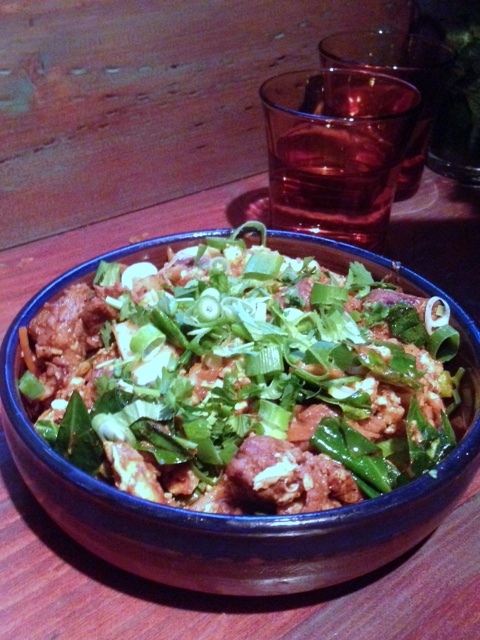 Our final dish was the lamb kothu roti (£9) with spring onions, egg and carrot. This was yet another tasty dish although it didn’t quite deliver the same wow factor that the bone marrow dish did. All the elements were well cooked and this proved to be a satisfying and homely dish. 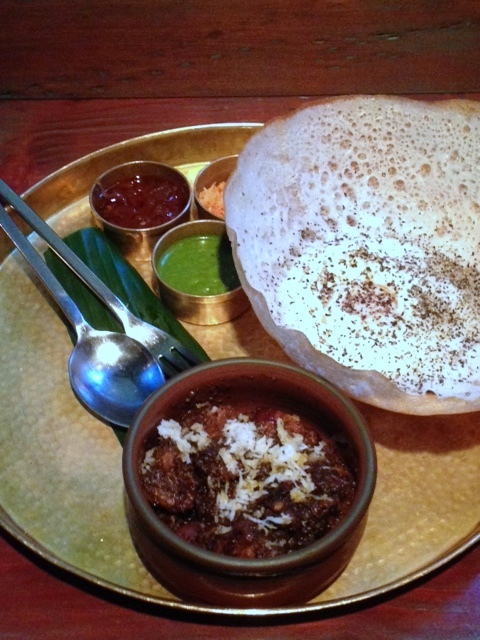 We loved the Hoppers experience and would happily go back again. In fact we couldn’t help but order a second portion of the bone marrow. The service was solid as well and we found the staff to be very knowledgeable. The wait was a pain, but we easily killed the time with a drink at a bar nearby. The Sethi siblings have the magic touch and they’ve proved it again with Hoppers. 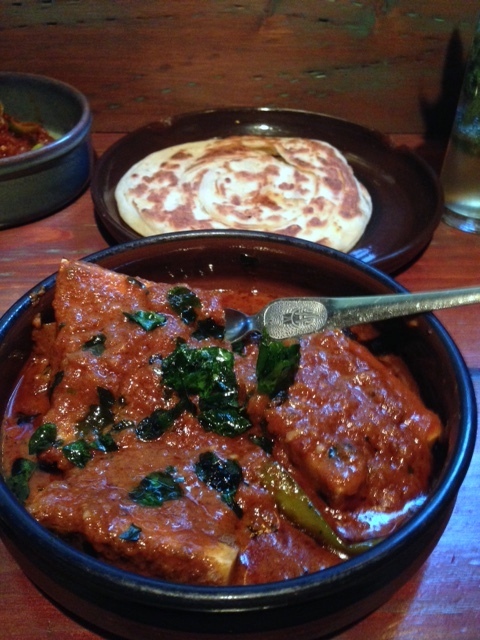 1) We enjoyed all the food, but the bone marrow was our absolute favourite. 1) The long wait for a table. Price: £20 – £25 a head, excludes drinks and service.